Learn the Clavicle osteotomy and resection of a hibernoma tumour from the left brachial plexus surgical technique with step by step instructions on OrthOracle. Our e-learning platform contains high resolution images and a certified CME of the Clavicle osteotomy and resection of a hibernoma tumour from the left brachial plexus surgical procedure. Tumours in the brachial plexus are rare. Primary peripheral nerve sheath tumours (Schwannoma and Neurofibroma subtypes) are the most common and may cause neurological symptoms if they reach a critical size at anatomically narrow spaces. Lipomata may present at the level of the brachial plexus and although slow growing and soft tumours, they may produce neurological symptoms when they compress the brachial plexus. The symptoms are similar to thoracic outlet and compression may be in the interscalene triangle, retroclavicular or subpectoral spaces. A Hibernoma is a rare lipoma subtype also known as an eosinophilic lipoma due to the classic histopathological appearance. The term Hibernoma comes from “hibernate” and the tumour is predominantly comprised of brown fat cells, abundant in hibernating mammals and in the adult human found in deposits around the spine, neck and axilla. 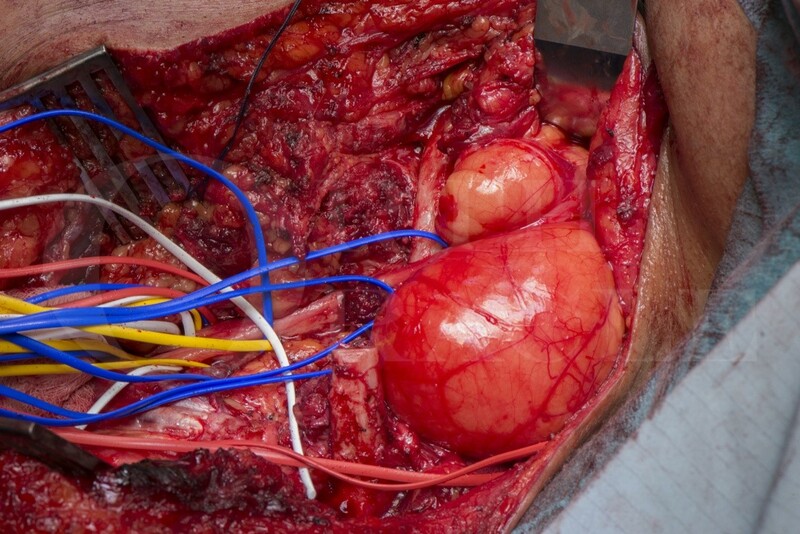 The tumour is benign but rates of recurrence are high with incomplete excision. Diagnosis is confirmed on biopsy and the decision to attempt excision is based on the presence of neurological symptoms, indicative of critical compression. As a slow growing tumour, neurological structures may accommodate and the anatomy may be distorted. The surgery should be undertaken by a specialist familiar with brachial plexus anatomy and possible patho-anatomical variations. A clavicle osteotomy may be required when the tumour “dumb-bells”under the clavicle and the nerves are critically compressed. The tumours are vascular and dissection should proceed with care and meticulous haemostasis with ligation of feeding vessels.